PodcastOne: Has Arizona changed enough to vote a Democrat into the Senate? Has Arizona changed enough to vote a Democrat into the Senate? With Republican candidates moving to the right in Arizona, can a former Green Party activist win over centrists? AP's Lisa Mascaro sits down with Speaker Nancy Pelosi for a wide-ranging interview. Sen. Doug Jones, D-Ala., comes by the AP and talks about his upset win, 2020 and even impeachment. The midterms had something for everyone with wins for both parties, but one thing is clear: voters are willing to elect a much more diverse slate of candidates with many victorious "firsts." 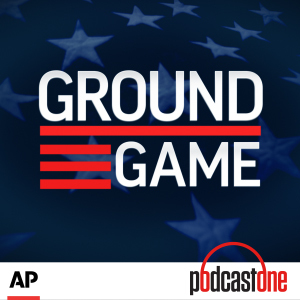 Ground Game turns the microphone over to you, the voter, to hear what issues are motivating you in 2018. With Dems vying for deep red seats in the OC, a senior senator facing a real challenge and at least one candidate under indictment, we're talking California drama ahead of the midterms. Unhindered by campaign finance restrictions, pressure groups are spending big bucks to support and oppose political candidates around the country. In places like Virginia's 10th Congressional District, both parties are fighting for 2018's most prized voters, suburban women ?swing voters seen as key to winning in this contentious election cycle. Senate Majority Leader Mitch McConnell speaks with AP about the contentious confirmation of Supreme Court Justice Brett Kavanaugh, the upcoming midterm elections and President Donald Trump. Missouri's Democratic Sen. Claire McCaskill is making a bid for a third term in a state that's become increasingly red, setting up a nationally watched showdown that could prove key to which party controls the U.S. Senate. Spoiler Alert: Could Gary Johnson's third-party bid cloud New Mexico's Senate race? Former New Mexico Gov. Gary Johnson has jumped into his home state's U.S. Senate race in a bid to unseat the Democratic incumbent. We explore what impact this pot-smoking, Libertarian ex-presidential candidate could have on the race.